With his stand-out 100m freestyle swim from day 1 of the Aquatic Super Series in Perth, Aussie Cameron McEvoy earned Male Swimmer of the meet. Cameron McEvoy cranked out the world’s fastest 100 freestyle so far this season (47.56) on day 1 in Perth and blew out the field again tonight in the 50m freestyle, scoring a 21.73 scorcher. Japan’s Rie Kaneto rocks a new All Comers and Japanese National Record in 200m breaststroke while competing at the Aquatic Super Series – 2:20.04 at 27 years old. Cuteness overload: Former World Record Holder, Eamon Sullivan, hugs a koala in Perth. 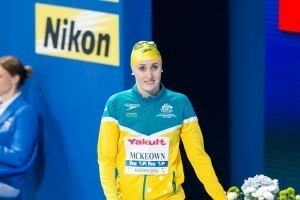 Australian breaststroker Taylor McKeown is the latest swimmer to withdraw herself from this weekend’s Aquatic Super Series in Perth, the tri-national meet among hosts Australia, China and Japan. 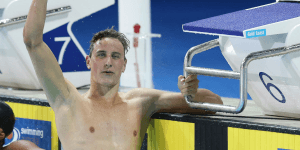 Australian Cameron McEvoy made major waves in the Perth pool on day 1 of the Aquatic Super Series, the tri-team spectacular which pits the Aussies against visiting squasd from Japan and China. As reported in our live recap, 21-year-old McEvoy set the pool aflame in the 2nd event of the night, the men’s 100m freestyle, where he threw down a personal best of 47.56. That time sends a hug message to the likes of speeding studs in Brazil and the Frenchman Florent Manaudou, just months out from the 2016 Rio Olympics. Not only was McEvoy’s time a personal best, but he takes over the top spot in the world rankings this season. Looking back at last year’s FINA World Championships, the mark would have won McEvoy the gold medal in the individual 100m event, stopping the clock .28 of a second ahead of first place finisher in Kazan Ning Zetao from China. Also putting up a sub-50-second time was 2nd place finisher James Magnussen, who clocked a 49.34 in just his second competition since returning to racing after having undergone extensive shoulder surgery last summer. Magnussen’s mark was just a hair faster than the 49.35 he clocked at the Victorian Open late last month. “We are trying to stay as relaxed as possible and don’t talk too much about possible wins, possible losses, possible records, possible medals, we talk about sticking to the process, really thinking about control what you can control, and to give it your best. To be honest there is not a lot more you can do, and tonight I see a team doing that and that makes me really feel proud,” said Verhaeren. Kinda sloppy editing mistakes – Cameron McEvoy (USA)? and Magnussen’s 49.34…. was just a hair faster than the 49.25 he clocked at……? Swimming is a crap shoot sometimes. He can do a swim like this I tapered and unshaved, but when tapered and shaved he might not go faster than 48.00. 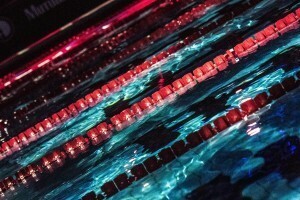 A great swim is a great swim – it is a moment in time and means nothing beyond that. If that’s right then he will break the world record at Australian trials.